I know I have been MIA for a while, I have been clearing, cleaning, sorting, packing and disposing my parents’ things at long last. I have been focusing my attention and energy on it, not much left for other things. 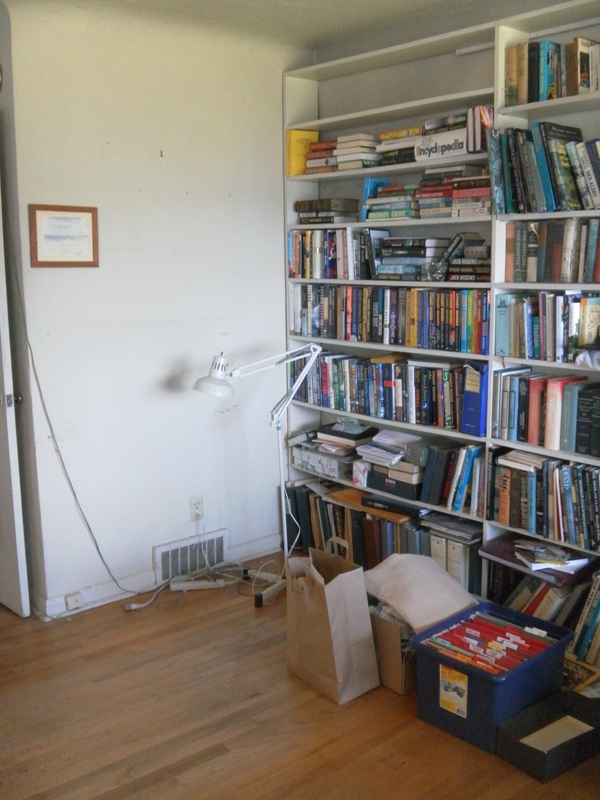 Last week was quite busy and tiring, but now we have a lot of empty space in three rooms. I have been sorting in preparation of the young meant who came Tuesday to pack up things for Candy, the rest is going to a good home – someone from my Breakfast Group. Thursday Lisa came for the grandfather clock, she is really excited to have it. The grandmother clock is going to Melody when ever she is able to come for it. 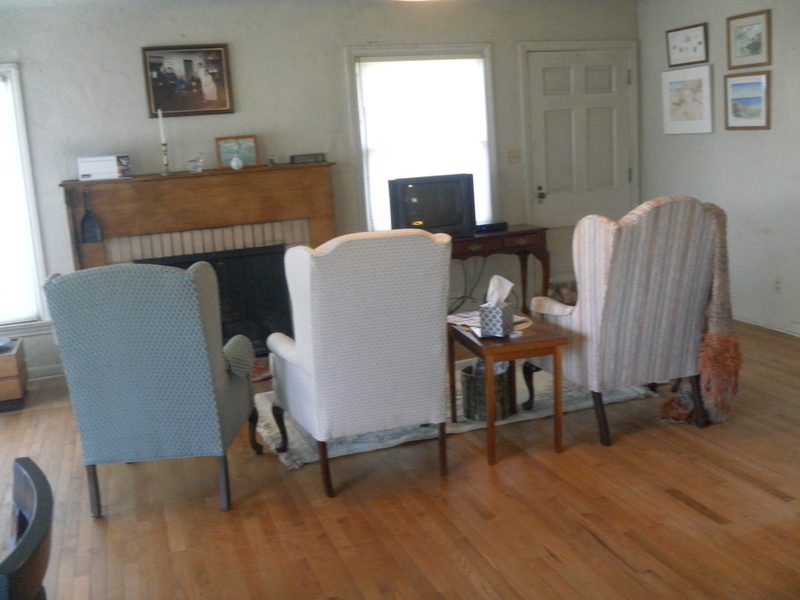 When I had 2 different estate sale people come, I found myself quite emotional about it. they both suggested I leave and have someone else do it. Well, there was only me, but I found I didn’t have the emotion when they left. The two brothers who came were enjoyable and friendly, fun to work with and it worked out well for all of us. After they left, I found the cable wasn’t working, so I spent an hour and a half with Direct TV to figure out what was wrong. We finally determined the cable was routed through the VCR, however, the VCR went with everything else. So with Jen’s help, I plugged things in, unplugged a couple of things and finally had a picture. What you see when you come through the kitchen. 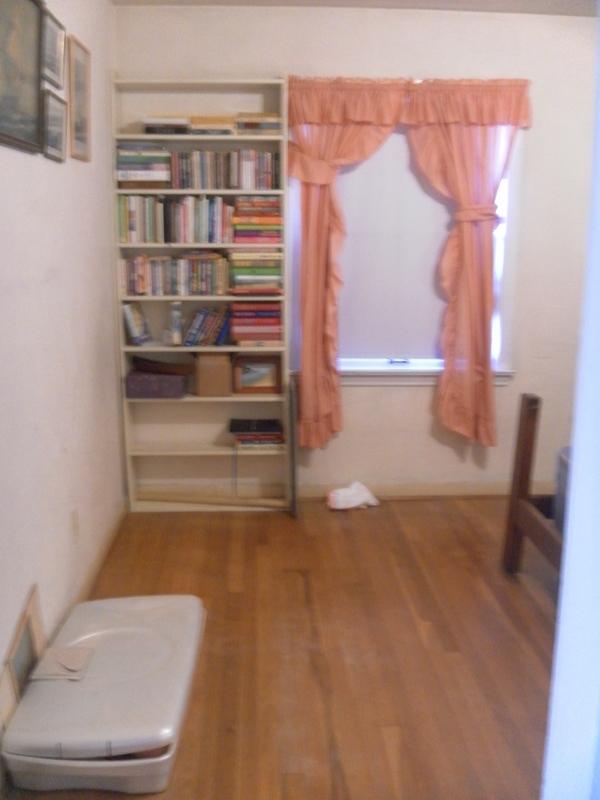 Nowhere to sit in front of the bookcase. The sofa table works fine for the tv. Unfortunately it was a bit snowy. We kept trying things to clear it up – I had it once but didn’t know how I did it. It still thinks it is going through the VCR and I was finally able to understand what button I pushed for a clear picture. 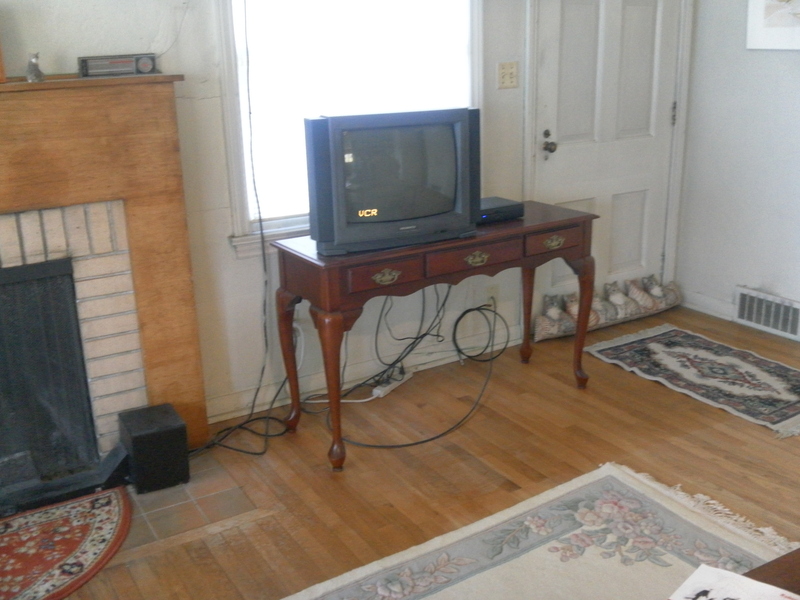 We have an old tv, there isn’t anywhere to plug in the cable. Now it is working but in the lower left hand corner it shows VCR. I can live with that. 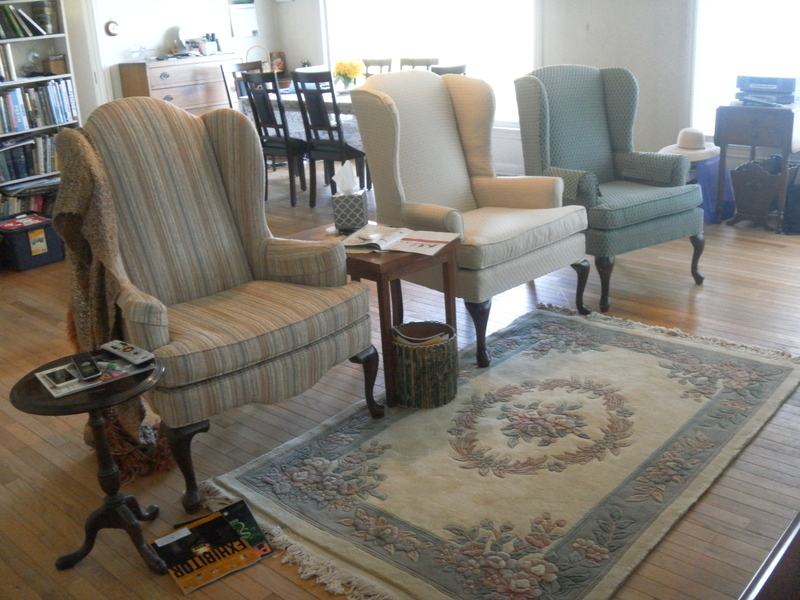 The brothers brought up 2 of our wing chairs and our sofa table for the tv. One did say he was wondering what we were going to sit on. I also asked them to bring up one of the book shelves to put in the office. They put almost everything in – there were a few things of Candy’s that didn’t fit in the truck. Steve came by on Thursday and took them. Still bits and pieces to find homes for. Blue chairs i gone – used to be green. 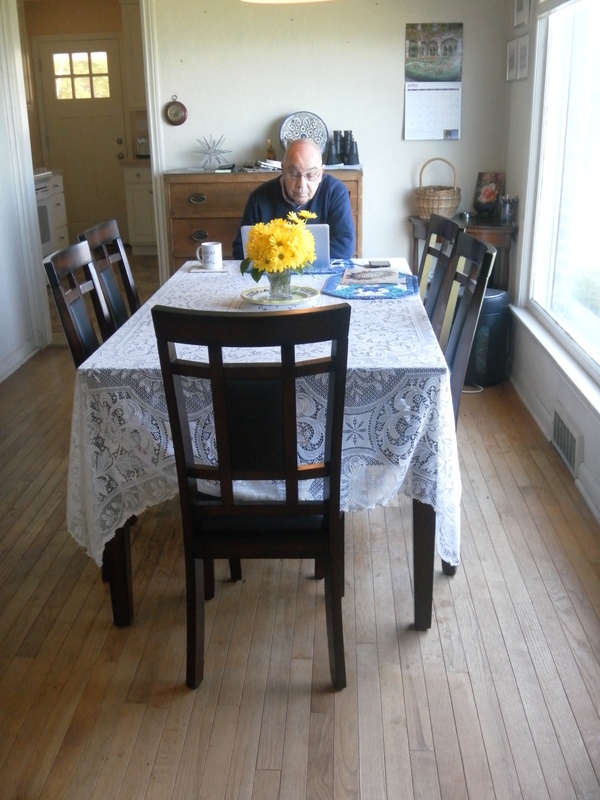 We have empty space in the living room and now our new dining table is in place. 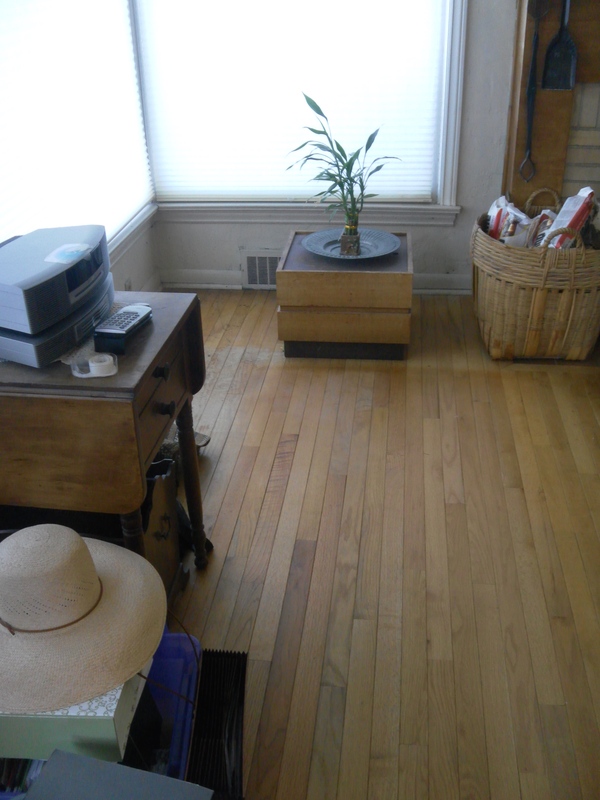 We have empty space in Mom’s room and also in the office. I’ve had a sore shoulder a lot of the time, but on the whole I have done very well. I am amazed and delighted I have been able to do as much as I have and Eddie has done so much too. We have also filled the recycle wheelie bin until there is no room – thank goodness Tuesday is recycle pick up. When it is empty, we have so much more to fill it again. Our new dining table. Eddie working on his Report – it has been a really bugger this month. 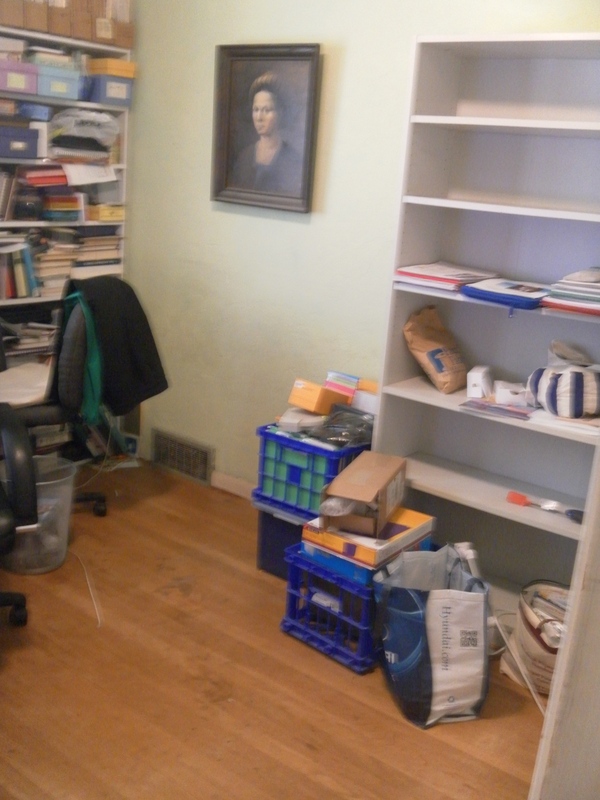 Mom’s room is cleared on one side – won’t dare show the other part yet. The two desks in the office are gone. I am going to build a desk for myself, then Eddie can have his back. I will say, I am tired and sometimes I think I am too tired to sleep. I have had some trouble sleeping and my lower back and legs have been uncomfortable – so far no flare-up. No doubt it is all the bending and lifting that has done it. Now I need to sort out the hooking things for the lady in Nova Scotia. I have the room now. 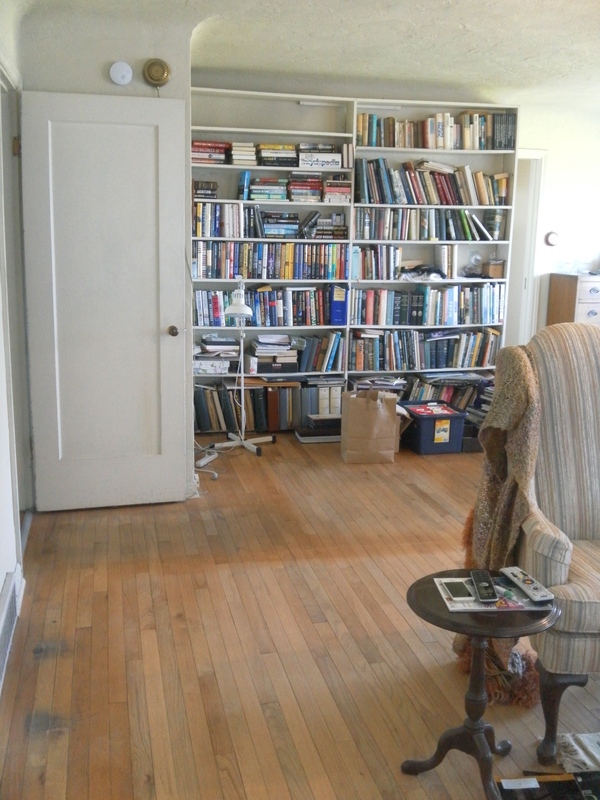 I am hoping to have the living room painted and the floors cleaned and polish – not sure how much will actually happen. I want it to be our home when we have Mom’s Celebration of Life. I will take some pictures and put them in this post to show what we have done so far. This entry was posted on April 12, 2015 at 2:56 pm and is filed under Musings. You can follow any responses to this entry through the RSS 2.0 feed. You can leave a response, or trackback from your own site. I can see it is starting to come together, Liz!! Love your new dining room table and chairs–so pretty!! 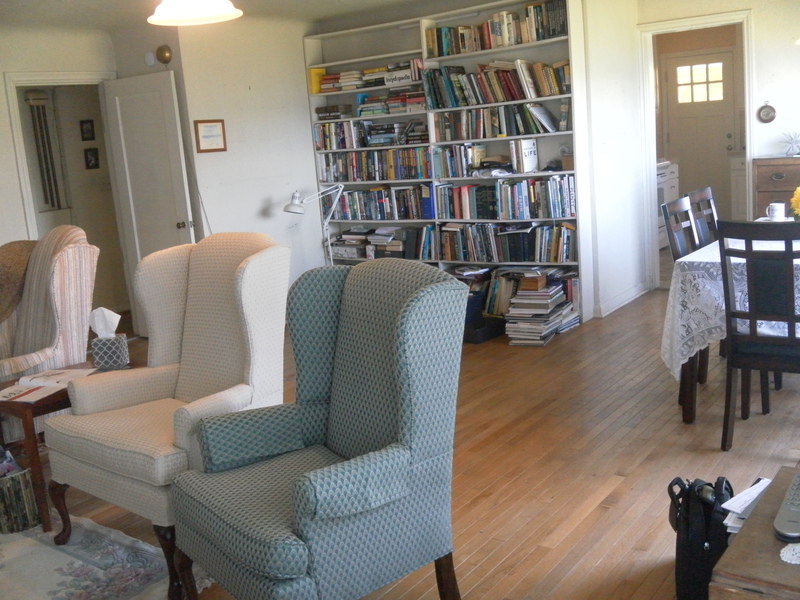 The wing chairs look nice, too. Am I remembering you also have a sofa downstairs, which will come up after things are done in the living room? I am so glad to be on this side of the project – I felt so bogged down for so long. Eddie has really helped once I got my tush in gear.